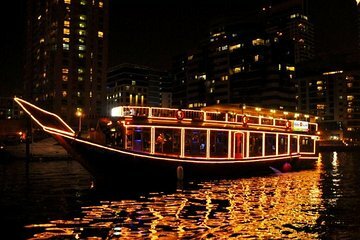 Step aboard one of Dubai’s historic Dhow ships for a romantic, 2-hour, nighttime cruise beneath the city’s beautifully-illuminated skyline. Sail along the Dubai canal, enjoying views of the incredible array of architecture that characterizes modern Dubai. As you ride you’ll admire sights like the Dubai Marina Yacht Club, Dubai Marina Mall, and the city’s numerous high-end hotels. You’ll also enjoy a tasty high-end dinner buffet, including soft drinks, tea and coffee. Your evening cruise also includes round-trip hotel transport.